Max power and mini bikinis ! That's going to be a spike ! 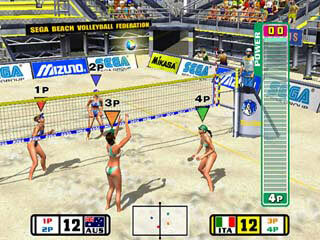 "Hit the beach for some high-intensity volleyball under the hot summer sun in Beach Spikers for Nintendo GameCube. 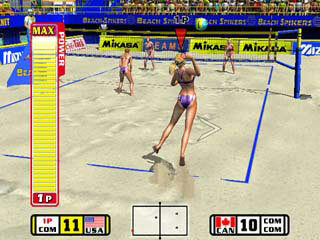 This Arcade smash hit showcases beautiful bikini-clad female teams of two in fierce competition for the volleyball championship. You can bump, set, and spike it with three friends in Versus Mode or team up with a customizable computer partner in Arcade, Training, and all-new World Tour Mode. Get the edge over competing teams by assigning skill points to your glistening beach babe teammate. You can also earn teamwork percentage points by honestly rating your teammate's skills on the sandy court. If she drills her serve into the net and you compliment her instead of reprimanding her, your teamwork percentage points will plummet. As you progress through the tournaments, you'll unlock new beaches, hairstyles, sunglasses, faces, and uniforms, which can be used in other modes. Shadows play across the court as the day passes, but don't worry, your summer never has to end!" "- Play as one of 16 different teams or create your own. 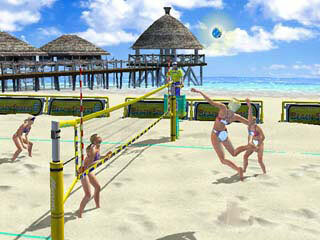 - Grab three friends and choose from four unique Versus Modes: Beach Spikers, Beach Flags, Beach P.K., and Beach Countdown. 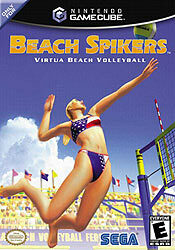 - Name your teammates and select their face, skin tone, hairstyle & color, bikini, country to represent, and sunglasses. - Dynamic camera angles, mind-blowing graphics and gorgeous character models."